Before talking about the new Indian Institute of Management (IIMs), let us look back at the way the management institutions in India developed. Way back in 1961, both IIM-Ahmedabad & IIM-Calcutta came into existence with support from the Harvard Business School, and MIT Sloan School of Management, respectively. However, the important aspect of these IIMs has been their distinctive vision, differentiated purposes, and aligned pedagogy & faculty. Likewise, other B-schools such as XLRI, IMT-Ghaziabad, SPJMIR, MICA et al. have also taken shape with clearly defined purposes, carving out a niche for themselves. As the renowned American Sociologist, Philip Selznick has said, organizations when ‘infused with value’ become institutions. Though, infusing value essentially requires a committed leadership as they not only facilitate infusing value but, help to inculcate those value to create a distinctive culture. To name a few exemplary academic leaders who have stood up to the saying are-Ravi J. Matthai, who played a crucial role in making what IIM-A is today; Dr. M L Shrikant- SPJIMR blossomed and reached new heights under his visionary leadership; A.G. Krishnamurthy stands synonymous with the School of Ideas- MICA; and, Mahendra Nath, the icon of excellence who strived for establishing IMT to groom leadership through innovation, execution and social responsibility. A stable and committed leadership is an essential requirement in the process of institution building. In the absence of the same, the institutions function like an organization without a soul and value. It behaves like a rudderless ship with no focus, purpose, goal and identity. Not having a stable and committed leadership is the biggest lacunae of the new IIMs who are now finding it difficult to have a definition for themselves and an identity. This is not to condone the fact that even the mentor IIMs nowadays are experiencing uneven troughs & crests with inadequate strength of faculty and unsteady leadership. The older private B-schools, on the contrary, are performing better in terms of their alumni base, committed set of recruiters, stable leadership, industry connect, and the quality of value it creates. Interestingly, except IIM-C, none of the 19 IIMs in India has yet achieved an AACSB accreditation. The rest four institutions of India in the AACSB accredited list only comprise private B-schools. Another grave of all constraints that the umpteen new IIMs in India are facing today is their locations. The locations of new IIMs are an impediment not only for accessing industry connect but also creating the linkages, which probably would have been much easier in case the locations were not this remote. Although, establishing & nurturing industry-connect requires a certain time to develop; the new IIMs despite having the nomenclature advantage, are finding it difficult to pursue. The remote locations of these new IIMs are also a huge turning-off for luring sound faculty members. Not only traveling inconvenience, even the lifestyle of academia takes a back-seat in remote or comparatively smaller cities; the bigger the community, the more would be the diversity, and hence, it eventually becomes the melting point for the exchange of cultures and thoughts. As far as the placements are concerned, which is usually a cynosure of B-school aspirants, the new IIMs have flunked. The placements in some of the new IIMs have been so abysmally poor that the MHRD had to seek details about the process and the packages offered to the students of 2015-17 batches. 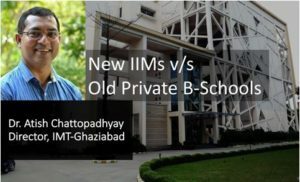 Owing to having no alumni base at all, the new IIMs are now feeling the heat, as the entire process of campus recruitment is a function of the reputation of its alumni. Apart from the placements and corporate funds, a strong alumni base also acts as a catalyst for influencing industry tie-ups, collaborations, and internationalization. Interestingly, when it comes to the fee structure, IIMs are not competitively priced- they are either equal to or way above other decent B-schools. This is notwithstanding that IIMs are public funded. Nevertheless, in this context, some private B-schools are surprisingly performing exceptionally well to self-sustain itself in the competition and plough back on the surplus it is making. My last but certainly the most important advice to the B-school aspirants would be to understand that Management education is an applied programme like medical sciences. It cannot be imparted with a mere classroom-based theoretical curriculum. The practical exposure to the real world is utmost necessary for learning and further development. Hence, select an institute which presents you the amalgamation of all the ingredients mentioned above, in the right proportion.